My new obsession: The Silhouette Instalift™! Or how many times have you had Voluma™ (which can be amazing, by the way, in moderation) or other fillers to accentuate your cheekbones and “lift” the lower face? The thing is, the Voluma does work, and it helps smooth things out around the lower eyelids as well, but there comes a point where you feel like your face is starting to look too puffy and the jowls (“marionette lines”) have not improved. You could do some filler down below your mouth and on your jaw to camouflage things, but putting too much filler in the lower face is one of the things that can give you “Plastic Surgery Face.” It’s that part of your face/neck where everyone is like: “You have nothing! You look great! You don’t need anything!” Now...the Silhouette Instalift™!!! Omg. Seriously. This is an in-office procedure that is virtually painless, takes about an hour, and has minimal to no downtime. Yes it is a thread lift, but it is not like the old ones that were causing problems and were taken off the market twelve years ago. 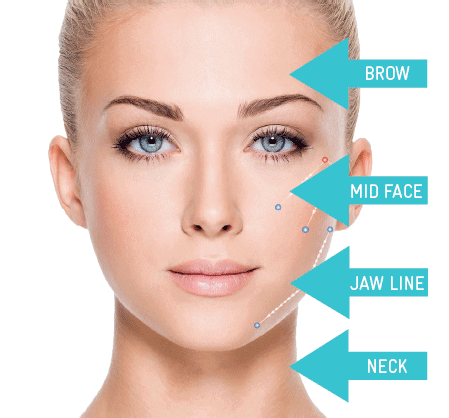 These threads are absorbable, made of a solid form of Sculptra (the injectable that stimulates collagen production.) The threads are placed just under the skin and can actually LIFT your jowl and neck area. And of course they do that whole collagen stimulation/tissue injury thing that all of the laser and microneedling devices do. They are relatively new in the United States, but have been available in Europe and other countries for years so---as usual when it comes to cosmetic procedures---we’re late to the party. It is said to last for up to a year and a half, and as it is dissolving it adds a small amount of volume that helps maintain some of the lift and changes your face shape back from a “rectangle” into a youthful “heart shape” again. When I first heard about the Silhouette threads, I was wary of putting something like this in my patients’ faces that would last that long and could not be removed. My main concern was “if someone has thin skin like me, are they going to feel the threads, or are they going to show?” So, when it comes to things like this, I am my own guinea pig. I have six in my face and neck (three on each side) and I really do think it has made a difference. Mainly because whenever I look in the mirror I no longer fixate and obsess about my jowls and wonder if it’s worth it to take that lower facelift scar… Of course, the Instalift won’t do what surgery can do, but it CAN give you that couple of millimeters up. And I have the thinnest skin in the world and you can’t feel them or see them at all. I think it is a great way to deal with our mid-life lower face obsession. Not only can you stave off surgery longer, but it can be used for maintenance if you have had a lower facelift in the past and it is starting to droop the slightest bit. Anyway, if this sounds at all interesting to you, come check it out. I am #obsessed.